New York Nights’ phenomenal dusk-till-dawn staying power was designed specifically for the city that never sleeps. 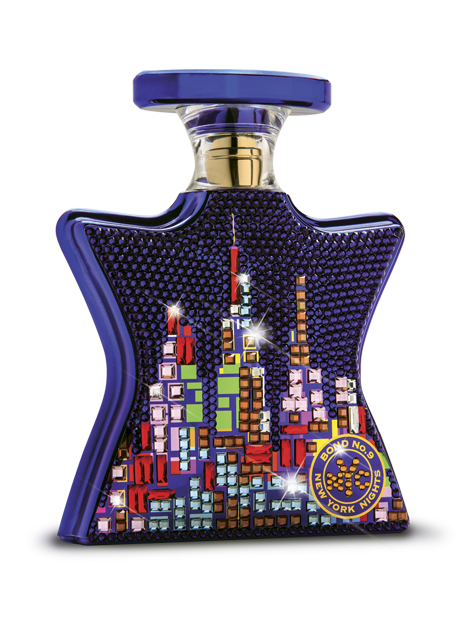 Both its 100ml special edition holiday bottle and matching box depict a beckoning nighttime Manhattan skyline, pieced together out of numerous multi-colored Swarovski baguettes, set against a backdrop of high-shine royal blue. Give a skilled artisan an iconic perfume bottle. Let the artist paint a shimmering, brave image of the night time New York Sky Line on the bottle. Drench the bottle with Swarovski high shine midnight blue crystals. Add multi colored, refracting Swarovski mini baguettes. Finally, place a discrete Bond No. 9 logo at the perfume bottle’s base and throat. Voila-you now have a precious objet d‘art. that will literally take your breath away. Is any perfume bottle worth a thousand dollars? Maybe. I’m certainly betting that this particular perfume bottle, like the early Lalique perfume bottles, will actually increase in value. Worth a thousand bucks? I don’t know. I do know that I smiled when I saw this bottle. I know that my sister smiled when she saw this bottle. I know that even experienced Saks perfuministas smiled when they saw this bottle It was those smiles that convinced me to make this investment. All of us will not agree on a price point for this perfume bottle. However, most of us will agree that a perfume bottle that can put a smile on all those faces is priceless.